After a serious fall, injury, or illness it may be obvious that your senior loved one cannot live independently, at least throughout recovery. Until they are healed they may need frequent help with activities like getting around the house, bathing, and taking their meds. In that case, around the clock assistance provided through live-in home care may be an obvious need. Not all situations are as clear. When senior family members begin showing signs of difficulty living alone it is common to begin part-time home care services. Often home care starts off as occasional or weekly help with certain activities like meal prep or transportation. As a senior continues to age, they may need more involved services, like help with personal hygiene or medication reminders every day. Many families often find that, eventually, their older loved ones need live-in care. Home care is non-medical assistance that can be offered around the clock. The question is: when is it time to start live-in home care? Your aging relative’s well-being is never worth risking. If your loved one has been diagnosed with a disease that affects their memory or stability, they are at a higher risk of suffering from home dangers. For instance, a senior with Alzheimer’s is at risk of forgetting important things like whether or not they have already taken their medication. A senior who struggles with balance is at risk of falling. Without live-in care, risks like these can endanger a senior’s life. If no one else is present at all time, no one will know if medications have been taken. Should a senior fall and be unable to get up, being alone for a long time could mean that they won’t receive medical attention or get help for hours or days. Signs like these are often evidence that living independently is no longer safe or healthy for a senior. While in many cases part-time home care can make a difference, sometimes live-in care is what an aging adult needs to allow them to enjoy the comforts of home. Illnesses take a toll on the body. For many seniors, the side effects of diseases, conditions, and the medications that accompany them can be inhibitive. Since many illnesses progress or cause side effects that can worsen over time, pay attention to your family member’s well-being. Talk to your loved one and even a medical provider, if possible, to determine if symptoms indicate that your family member should not be alone at any time. Sometimes aging adults insist they are fine on their own. They may not want the expenses of live-in care or may prefer their complete independence. However, when obvious illness, injury, or difficulty suggests they may need to have help available at any moment, it’s time for live-in care. Although your senior loved one may be able to often act independently, it can be important to have someone accessible as an extra set of eyes or for assistance when needs arise. About 90% of aging adults expect to and hope to live at home in their senior years. Many prefer the comforts of home over living in a facility. With live-in home care, seniors get to enjoy the comforts of home as well as the benefits many facilities offer, like 24-hour assistance and personal care services. 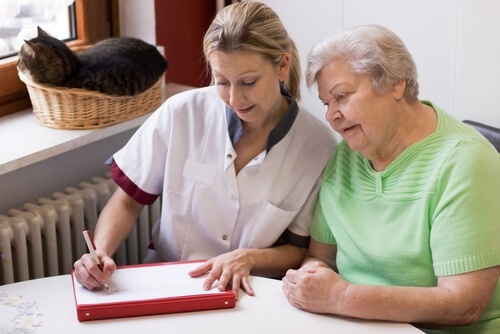 Live-in care provides the added benefit of one-on-one care customized to an individual’s need, generally, at a significantly lower cost than being in a facility. There are many reasons seniors and their families choose home care. Download the FREE Guide to Home Care to learn about this preferred option.